Unfortunately, many dogs suffer from skin allergies which usually results in lots of itching and discomfort for your dog. 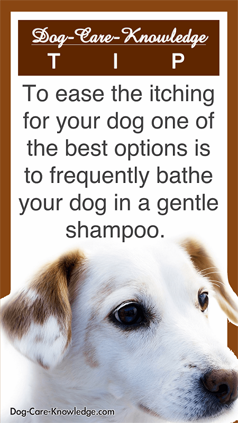 One of the best options to give your dog relief is to bathe your dog in a gentle shampoo frequently. Nature's Specialties Hypo Aloe Genic shampoo has been specially formulated for dogs with sensitive skin or those that require frequent baths. Following up with a good conditioner will also help to rejuvenate your dog's skin as it adds extra moisture and prevents excessive itching. We suggest using Nature's Specialties Re-moisturizer with Aloe. Finally, you can also try Wham Anti-Itch Spray for those really itchy areas or just for in-between baths. As with humans, there is no cure for skin allergies in dogs but, with a little bit of help, you should be able to make your pooch more comfortable in his own skin.